Buffalo chicken chili is loaded with flavor and will definitely warm tummies and taste buds! When I saw this recipe for buffalo chicken chili on my friend Carolyn’s blog, I couldn’t wait to give it a try. 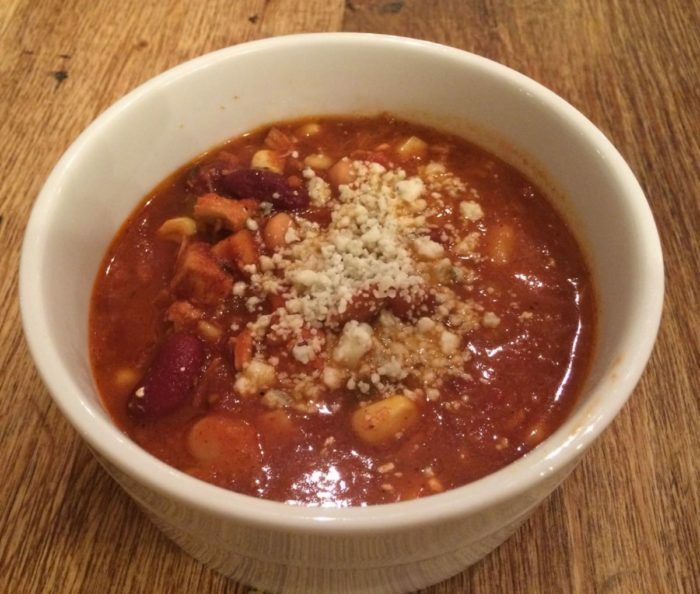 Every recipe I’ve ever made of Carolyn’s has been outstanding, and this chili is no exception. My kids ALL raved about it and didn’t mind eating it for lunch two days in a row (it makes a huge amount). This recipe is a fabulous way to use boneless, skinless chicken. It has tons of flavor~along with considerable heat. It may be too spicy for some, but no one in my family found it too hot to handle. For those who prefer a milder chili, seasonings can definitely be adjusted. Although the chili is already flavor packed, you can take it even more over the top by adding blue cheese crumbles. It is almost like eating buffalo hot wings in soup form! So kuddos to Carolyn for creating such a yummy and unique chili. I sure hope she’ll keep great recipes coming! Let me hear back from you if you try this. Thanks for stopping by. Be blessed, and stay savvy! If you love wings and hot sauce, you'll DIE over this buffalo chicken chili! In large skillet, sautÃ© onion, celery and carrot in olive oil for 3-5 minutes. Add chicken, chili powder and cumin; cook on low to medium heat for 5 minutes. Add crushed tomatoes, tomato sauce, and chicken; cook until seasonings are incorporated. Add beans, corn, broth, celery salt and cilantro;cook for 30 minutes on low, stirring often. Add the wing sauce and cook for a good 20 minutes. Add the cream cheese, stirring until melted and dispersed in soup. Add more chicken broth if mixture is too thick.